Salud 3, 28013 Madrid, Spanje. 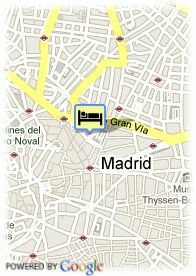 Liabeny Hotel is strategically located in Madrid centre. 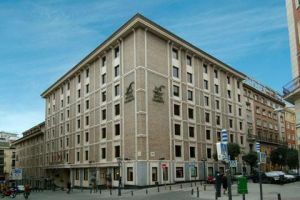 At just 100 metres from the Gran Via and the Sun's Gate, The Liabeny Hotel is surrounded by cinemas, theatres, restaurants, monuments and museums. The establishment has 220 comfortable rooms equipped with full Bathroom, flat screen TVs and pay TV, as well as free Canal+. Furthermore, it has 5 meeting rooms, which are the perfect place to hold work reunions or exhibitions. In its restaurant 'Sensaciones', the client could chose between a rich offer of traditional dishes, and more elaborate ones, as well. An elegant hotel in the city centre with a perfect location which allows easy visit to the main touristic attractions of Madrid. Betalende overdekte parking aan het hotel (17.12 €), Reservatie verplicht.